Itâ€™s July of 2010, the summer after I graduated high school. I’ve spent the last few weeks backpacking across Europe with my best friend and visiting the big tourist cities. I’ve ended up with my mother in a place the world tends to either avoid or forget: Belfast, Northern Ireland. My grandfather, John Toal, emigrated from Belfast in the 1940s because of the religious persecution that rendered him unable to find a job. After starting off in London as a janitor in a bank, moved to the United States, where he worked his way to a high-level banking executive position in California. My mother and I have returned to his homeland to visit relatives, but also, though we donâ€™t admit it, to remind ourselves of where we come from and who we are. On this typical gloomy Irish day, we and a cousin who still lives in Belfast visit Donegal Road, looking for number 490, the house in which my grandfather grew up. As soon as I step out of the car, I am intrigued by a large memorial on the street corner. 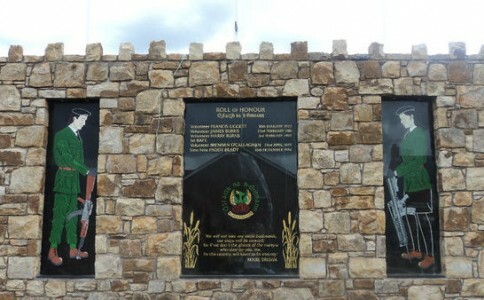 With large reliefs of soldiers on the wall, it appears to be some sort of a war memorial. After closer inspection, I learn that it is actually a memorial to all the Catholic IRA members from this neighborhood who fought and died in the Troubles, the three decades of turmoil that defined Northern Ireland from in the 1960s, ’70s, ’80s and ’90s. Growing up, my mother told me all about how Belfast was a city torn between two communities that hated one another: the Catholic nationalists and the Protestant unionists. 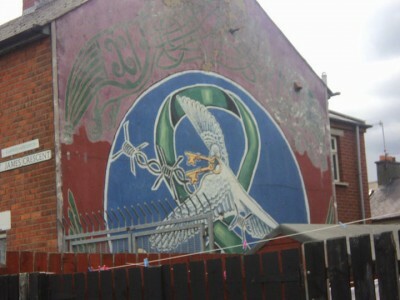 For years, the Protestant majority repressed the Catholic minority, until the situation came to a boiling point in the 1970s and Belfast erupted into violence that continued until the peace agreement of 1998. As we walk down the street, the stories Iâ€™d always been told about the fighting and hatred come to life for me in the political murals and graffiti covering many of the buildings, and the suspicious, gloomy faces of everyone I pass. When we find 490 Donegal Rd., I am struck by how small and nondescript it is. The difference between this house and my grandmotherâ€™s beautiful home in California is striking. As we turn the corner to go visit the cemetery where my relatives are buried, the black clouds above us finally open up and begin pouring rain. We run into a nearby church for shelter, and my cousin offers that this is the church my grandfather attended while growing up. The church is where I feel my grandfatherâ€™s presence the most. I have very few memories of the man who died when I was only three, but I have felt his presence strongly in my religious life. As a Catholic in Ireland during the 1940s, my grandfather was persecuted for his faith and unable to find a job. When he and my grandmother moved to America to find better opportunities, he was separated from his entire family. He clung to his faith and culture. After he died, my mother took great pains to continue his legacy. As a consequence, I have gone to Catholic mass every Sunday and attended Catholic school for my entire life. I never really felt the connection to my grandfather, though, until I returned to our homeland: gloomy, troubled, beautiful Northern Ireland. Who I am is the same as who my grandpa was, an Irish Catholic who wonâ€™t give up who they are for anyone or anything.